Bulgaria and Israel have signed two military agreements at a meeting of their Defense Ministers, Anyu Angelov and Ehud Barak, in Tel Aviv. The first agreement provides for joint military drills between the armed forces of Bulgaria and Israel, the Bulgarian Defense Ministry announced. "The agreement aims at expanding the military cooperation between the two states through the carrying out of joint drills, which will lead to greater interoperability and improvement of the training of armed force units for working in an international environment," explained the Defense Ministry in Sofia. The second document singed Sunday at the meeting of Anyu Angelov and Ehud Barak in Tel Aviv is a Memorandum of Understanding for cooperation in military industry; it is signed by the Israeli Defense Ministry and the Bulgarian Economy Ministry. 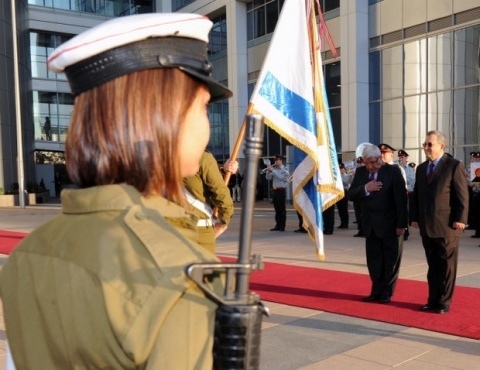 The memorandum on the military-industrial complex regulates military manufacturing and arms trade as well as research and development activities in the ties between Bulgaria and Israel. "I am convinced that these two agreements that we signed today are not just a document for business and a document for the armies of the two countries, but also bring a political message – Bulgaria and Israel are a step closer towards stronger cooperation and a strategic dialogue," Bulgaria's Defense Minister Gen. Anyu Angelov declared in the Israeli capital. His talks with Ehud Barak lasted for one hour, focusing on various defense cooperation options, including information exchange.